This battle introduces the Trobruk Trilogy to CC. 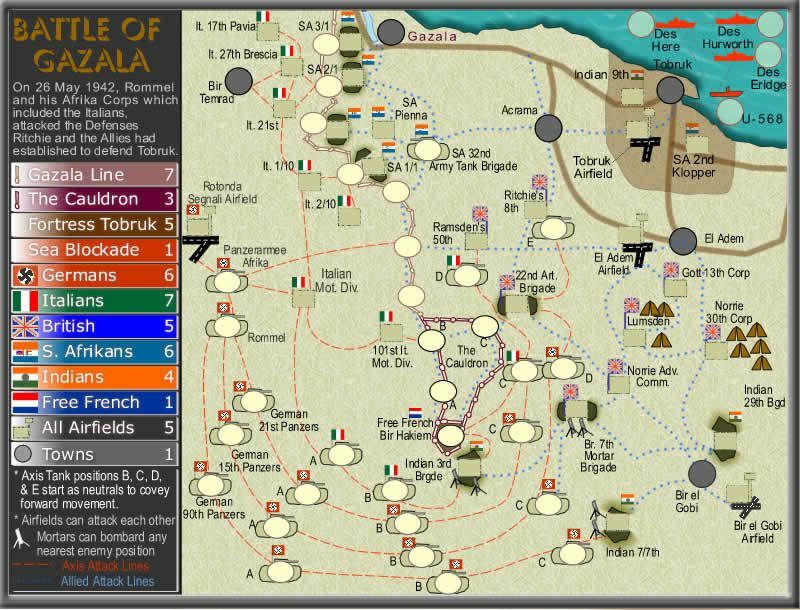 The Battle of Gazala marked a turning point for the British and Allies, who had up until 26 May 1942, enjoyed the liberties of the North African Desert. 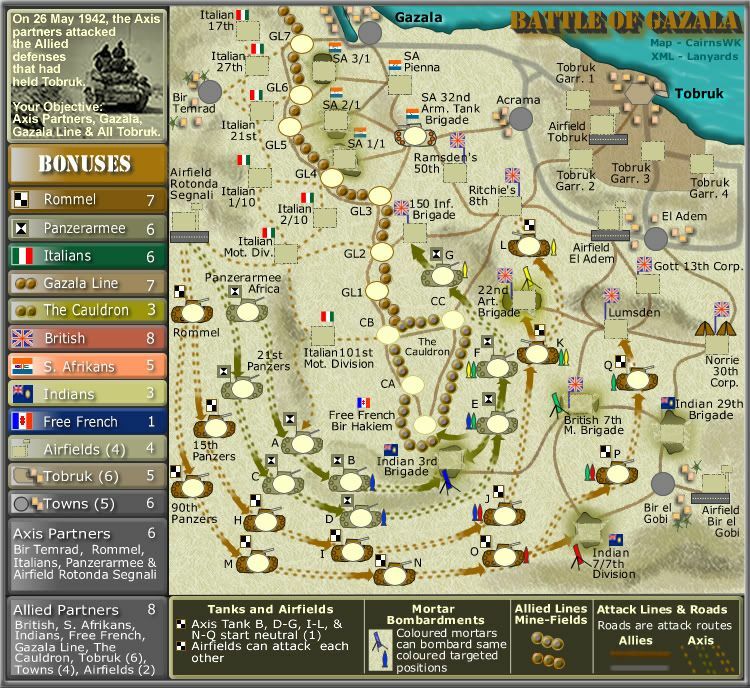 Rommel broke this hold, and after successfully taking Tobruk, went onto battle for El Elamain and finally he was forced defeated by the Desert Rats (Australia and other small Allied Forces) and the British under Montgomery. I beleive it is an integral part of the WWII war history. This map provides plenty of features and variant sized regions to battle for. * Rommels tanks (who can only advance on the taking of 1 neutral territory) advancing forward on their attack line, until they reach their destination. * Airfields where Stukas and Allied aircraft can attack each other. * Mortar bombardments to neutralise the tanks. * the breaking through of the Gazala Minefield line, and the The Cauldron. Bonuses are not yet worked as these are only very lose drafts at present and will undoubtedly change. 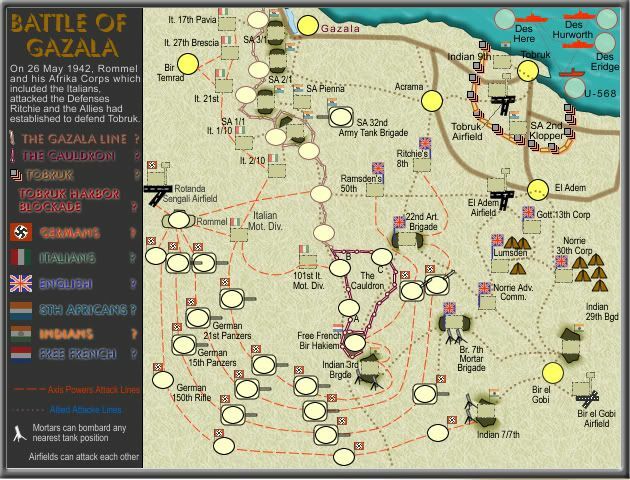 I hope everyone enjoys....The Battle of Gazala! Last edited by cairnswk on Tue Mar 25, 2008 2:12 pm, edited 44 times in total. first impression: WTF? where are the terits? where are the continents? how do you attack? second impression. OMG pearl harbor is easy compared to this. the map is so busy and everything seems so hard to understand. perhaps it's because his is the small map. perhaps not. i find the continents rather hard to spot. plus there's a lot of confusion going on. is tobruk continent formed of the 12 little square thingies? where will you put the names and armies for them? where are the south africans? i can't seem to find their flag on the map. do the germans really have 18 terits? why doesn't rommel have a flag? what are the yellow terits? who's going to hold the indians? they have 11 terits but they're scattered all over the map. all the attack routes going back and forth re really really hard to follow. DiM wrote: first impression: WTF? Oh DiM...you do rush in don't you? Please go back and study the map for a little bit, and in the next updates things will become much clearer...I hope! I'm sure it will. Yes, this one is difficult, but I think after you get used to all the lines etc...i.e. attack routes....strategies will be very much in play. mibi wrote: needs a spermdonationroom. On steroids LOL...nice one Mibi! in the meantime you edited and added some explanations. anyway that was the first impression. i've analyzed the map and to be honest i still don't find it very user friendly. for example i can't find the south africans. i'll be damn but i can't find the 7 terits you mention. also where are the 4 terits of tobruk? i see in that area 12 square little things. a yellow circle and airfield and 2 indian terits. i still don't know what are the yellow circles. the terits without flags begin neutral? also the bombarding closest tank is kinda confusing. how do i know what tank is closest? for example the mortar in indian 3rd bridge can bombard the tank on the left or the one on the right? the one on the left seems closer but i can only be sure if i put a ruler on the screen. also the french flag is wrong they have vertical stripes. the germans have 20 terits not 21. is rommel the 21st? some attack routes are doubled. for example ritchie's 8th is connected to 22nd art brigade by an allied attack line and by an axis attack line. many areas don't have names. 4. Flags chaged from transparency to full colour. Dim, thanks for input and impetous to change/clarify things. Next update, i'll work on the paths more to clarify and reduce again where i can. b. The Cauldron terts are named CA. CB, CC. 2. Attack lines are cleaned up and some terts moved to make some more space. 3. Small map size down to 600xp wide. Looks good so far - definitely a lot going on. 3) Mortars - might be best if you drew a line or some sort of shading to indicate their range. Also, whilst I realize people SHOULD know which groups were working together - you might want to indicate Axis groups and Allies groups. Or are we to assume Axis = German Flags + Italian Flags and Allies = everything else? Make sure to include German Flags by the boats (with German names). Taking care of this would alleviate many of my following mortar questions. 3a) Indian 7/7th Mortar - supposed to be 77th Mortar? It's Bombardment location could be confusing. Seeing as how it has a direct attack line on German 90th Panzers C, how would one choose to Bombard instead- or vice versa? Or is it's nearest non-attackable position? Probably best by moving 90th Panzers C much closer to 90th Panzers B. Maybe move 15th Panzers C down a little. 3b) Indian 3rd Brigade - ANY nearest enemy position? Will it be Italian Mot Div B [And/Or] German 21st Panzers C? They wouldn't bombard the Free French? 3c) British 7th Mortar Brigade. Can it reach all 3 of it's opponent's bases [German 21st Panzers C, German 15th Panzers D, and Italian Mot Div C]? 4) Color for Gaza Line no longer matches legend. 5) Gaza Line has a huge bonus for only 4 terrs [Gazala, Acrama, Ed Adem, and Tobruk]. Add in 3 more terrs [Indians 9th, Tobruk Airfield, and SA 2nd Klopper] and the bonus is now 12 for 7 terrs. EDIT: Ignore the Gazala line stuff - I see it now. I assume the Brown line from Gazala to and around Tobruk cities is actually Tobruk (not just the 4 terrs inside the brown shading)? Last edited by Aerial Attack on Sun Oct 21, 2007 11:59 am, edited 1 time in total. When can I let my bonus skills lose on this bad boy?? only 8 votes....is there not more interest than this in Rommel and Tobruk? cairnswk wrote: only 8 votes....is there not more interest than this in Rommel and Tobruk? i'm still trying to get a grasp on things and understand the map fully until i vote. i'm curious how will the german advancement happen? the b c d positions will be neutral from the start. what value will they have? because i don't think anybody is willing to fight through a lot of neutrals to get a huge continent that will probably fail to hold because of it's vastity. i'm somehow afraid that those terits will remain neutral for the whole game as nobody would bother killing all. if for example i'd start with all the playable german terits i'd still not go for the neutrals i'd simply gather everything on panzerarmee afrika and from there go for something else. don't cry. here is my logic. i start with panzerarmee afrika, rommel, the airfield and 2 of the panzers in A position. that's 5 german terits from 9 available from the start. so i'd say a pretty good position to take the german continent. i still have to kill 12 troops in 4 terits from the other players before i can focus on the neutrals. let's say i do that. at this point i have all the german terits available from the start. and i still need to kill 7 neutral terits. by the time i manage to do this other players will have the smaller continents and more troops than me. i'll have 5 borders to defend and i'll be in a really delicate position. because i hate putting myself in delicate positions i would never go for the german continent. hard to get hard to hold and not such a big reward. i have another idea. why not make the 3 german attack lines as separate continents? then each attack line gives +2 if held with the initial outpost. the total would be 7. not much bigger than what you have but the fact that it can be held on parts (similar to the planes in pearl harbor) makes it a much more attractive continent. You know DiM....not crying, just down coz i think this could be areally good map. Anyway....with solutions like the one above...it's nice to have the positive DiM back. I must say that when i create mine first map WWII EASTERN FRONT,people have negative feedback with german flag and i must remove from map,because these present Nazi Flag. Mine sugestion is that you insted These Flag put Symbol of German Army-Wermaht. qwert wrote: I must say that when i create mine first map WWII EASTERN FRONT,people have negative feedback with german flag and i must remove from map,because these present Nazi Flag. Thanks Qwert...I'll try that...experience is a good teacher. Below is still current v3. I tried to do as Dim suggested and work into the panzers two continents. 1. Two separate armies for Rommel and Pazerarmee - i haven't worked the bonuses yet, as i am sure some will have their say on that. I found Rommels Afrika Corp flag (black and white check with palm tree and unit number) but only the blakc and white check comes out in such a small version. Subsequent to that, I had to colour one of the flag green to differentiate between the two continents. Qwert, I did find the Wehrmacht flag from 1939, but that was abondoned during the Nazi era and so i have used to official Nazi war flag (very small version) for the Sea Blockade; again for differentiation. 4. Some of the legend resized - this will continue to change up or down as required by space demands. -is it on purpose that you made the square having a pixely look? We don't know what can attack what, specifically towns. also, bonuses are still incredibly unclear. I don't know about this this one Gnome. If you don't want to hurt someone feelings then why do say somthing like this at all. Why don't you wait until you see what is developed down the track. If after v20 or so which some poeple's maps get to, the graphics haven't move on, then you ask this question. But to ask it after v4 and still in New ideas.....! Not everyone Gnome has your drawing skills also and i am not one of those people. Further what i don't understand is why use this tiny text in size 7 to say to the mapmaker don't be mad at me. Why hide behind this. Can't you be open about what you have to say? As to the remainder of you items in that, i'll answer them later. unriggable wrote: We don't know what can attack what, specifically towns. also, bonuses are still incredibly unclear. unriggable...there is substance to your first point, but my GAWD! What is it that you don't understand about a 6, a 7, a 1, a 4, etc etc. and icons marked with a flag? Sometimes I think some people play stupid and dumb on this site just so they can make a comment. Can't you read and pull information on a map together to make something of it. Gnome...below is some corrections to your query above. 2. Fixeda and names moved. 4. yes it is on purpose at this point in time because i haven't yet decided how i want to show these on the sand in these first few draft versions, buit it does show roughly where they will be.